Let’s start with the label. Don’t be surprised if you haven’t heard about it until now since it was brought to life just a few seasons ago (in 2010 to be precise). 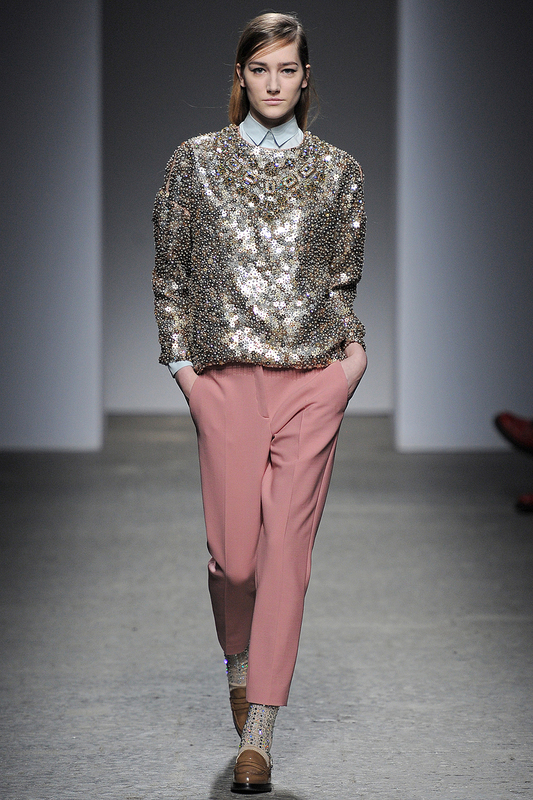 Alessandro Dell’Acqua, the designer, decided to start anew after leaving his eponymous label and opted for the name No. 21 simply because it is his lucky number and date of birth. His main focus lies on outfits which are suitable for daily life therefore it can be assumed that his inspiration comes rather from looking at street style shots than from attending gala events. A quite unusual couple made an appearance in the fall 2013 collection: Italian and English influences. Both partners didn’t shy away to bring their typical fabrics (like tweed and lace) and other staples to the table. Not all the resulting looks were a success, but some of them had something about them, a certain something. Just like the one pictured above. At first sight it is quintessentially English which is probably mostly due to the colour combination (pink and brown*), the silhouette and the fabric (boxy space-dye knit sweater). The first images that it conjured in my mind had a lot to do with books which are set in old London. However, there was something else lingering in my thoughts, that something else being probably unexpected elements like lace, for example. And yes, embroidered birds. Now, I’m not ashamed to admit that I would not shy away from wearing this ensemble, just as it is, straight from the runway. First cow prints, then birds. Who would have thought that? * Apparently I have something for this specific colour combination. Remember this? Luckily, our look on fashion/design still developing, seeing things from another angle, but also we can keep it close to ourselves. These days prints, embroideries (just to name a view) are applied in a way that is interesting to us, not just looking at it, but as you describe, to wear. And at the end of a day, you look in the mirror, different, but it’s still „you“ and feeling comfortable!! Have a lovely evening dear Marzena!